Carried for over 100 years by the brave few on battlefields worldwide, worn at the side of countless law enforcement professionals and gracing the bed stands of innumerable citizens, the 1911 has come to symbolize the might of freedom’s march and its resilience against the tests of time. It has evolved, been remade and reimagined by countless manufacturers and is an ever-present testament to the superiority of design. Companies putting their “spin” on the timeless design pitch products touting “old meets new” as their exemplar and invent new words and phrases in attempts to set theirs apart from a vast field of competitor’s wares. Words and phrases. 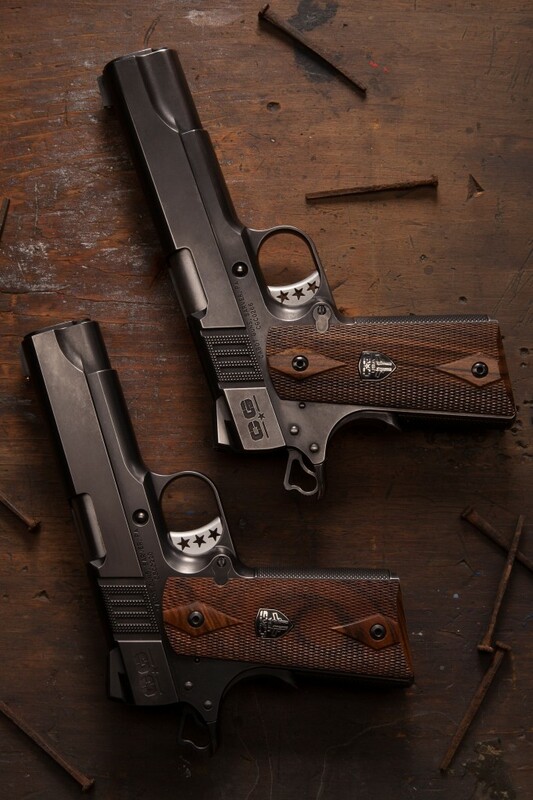 These are often all that is truly different between the excess of 1911 models offered in today’s market. Not true of the Cabot Guns family of pistols; their pedigree is that of the primeval 1911 envisioned by visionary John Moses Browning. 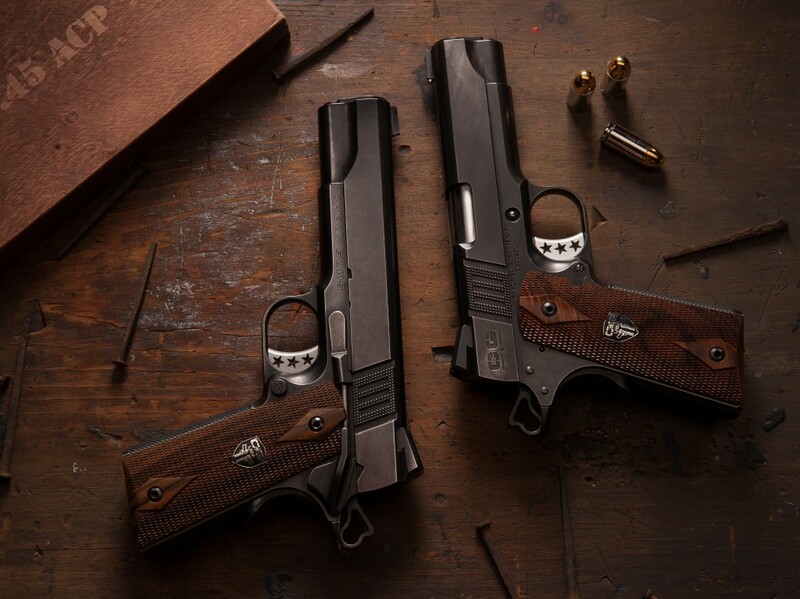 In the case of Cabot’s Vintage Classic 1911, old hasn’t met new – new has instead stepped into a time machine, bringing modern technology and methodology to the most classic of designs. Cabot always begins with solid blocks of steel. The frame and slide of the Vintage Classic are constructed of 416 Stainless Billet which is hailed for its superior properties. Cabot’s computer-controlled precision machining and build processes are invigilated by artisan craftsmen who ensure that each individual part is better-than-perfect in dimension and consistency. A proprietary hardening process coupled with an innovative thermal chemical treatment of the steel creates a durable yet worn finish that evokes the appearance of a well carried and much relied on sidearm. It is uniform in toughness, yet with a unique and varied patterning of perceived distressing on the highs and deepening of the lows. The pistol appears to glow from within, as if still warm from being carried at your side the whole day through. Available in Government or Commander sizing, the beauty of the Vintage Classic is well more than skin deep. Within the Commander resides Cabot’s revolutionary Full-Cycle Technology – meaning it retains the same cycle-length and legendary reliability of its full-sized Government match. Both are hand-fitted with match-grade crown-cut flush-fit barrels. Atop either is incorporated further innovation – a spherical shaped gold bead front sight or optional tritium vial fitted in Cabot’s Reverse Dovetail, eliminating potential snag points and maintaining true zero draw after draw. Interrupted only by a lowered and flared ejection port featuring a machined-in-place Perfect Fit Cabot Ejector, full-length front to rear slide-top serrations lead your eye to an optional black or tritium bar, low-mount fixed or adjustable rear sight. Completing the slide are Cabot’s renowned Trademark Trinity Stripes – providing the ultimate in tactile sureness when racking a round into battery. The shooter’s interface with the Vintage Classic is further buttressed by grip-ensuring 24 line-per-inch Rhombus checkering along both the front strap and main spring housing of the pistol. The beveled magazine well lends to faster magazine changes and feeds smoothly inside grips of checkered Turkish Walnut or white American Holly. A stand-out aluminum wire-EDM cut Tristar trigger compliments beavertail and thumb safeties, a one-piece full-length guide rod, slide stop and magazine release all billet-made to hair-splitting specifications. The Vintage Classic is Cabot’s ode to the original – a mechanized poem to be sung and enjoyed by shooters the world over. As the best of all worlds, the Vintage Classic represents a return to tradition through the employment of the cutting-edge. Summed up, the Vintage Classic is the simplicity of precision implemented cleanly and without peer. To place an order, select your pistol options below. On checkout you will be given the option to pay in full OR place a $500 deposit to begin your build. Once we receive your deposit, we will confirm your options and start your Cabot.